Brentwood Home Cedar Mattress Review - Eco-Friendly Support? Home » Brentwood Home Cedar Mattress Review – Eco-Friendly Support? Brentwood Home Cedar Mattress Review – Eco-Friendly Support? If you have been searching for an all-natural, eco-friendly mattress, it might be time to take a look at the Brentwood Home Cedar mattress. The Cedar is a hybrid mattress that incorporates individually-wrapped coils as well as Dunlop latex and New Zealand Wool. Having reviewed the mattress before, I was very excited to give my new thoughts on the Cedar. Is this all-natural mattress the one for you? Read on for my full review. The Cedar is a hybrid mattress with latex and individually wrapped coils. It is a great match for back sleepers and fans of all-natural mattresses. You’re looking for a long-term investment. The Cedar contains latex as well as high-grade coils. These are both very durable materials, so this should be a longer-lasting mattress. You will spend some money up front, but the Cedar should last you for some time. You are a hot sleeper. If you overheat at night, the Cedar should be a good option for you. The coils allow for a good amount of airflow, while the latex layers and wool should help dissipate heat as well. Overall, it should be a cooler sleeping mattress. You are a back sleeper or want a supportive mattress. The coils and multiple layers of latex make this a very supportive mattress. People of all sizes should get the support they need on the Cedar mattress. Back sleepers, even of a larger size, should feel properly supported on the Cedar. You are looking for an all-natural mattress. The Cedar contains components such as responsibly sourced wool and latex. If you want to avoid certain chemicals in your mattress and prefer eco-friendly products, the Cedar should work for you. You are a lightweight side sleeper. If you weigh 160 lb or less, the Cedar should offer you great pressure relief. That top wool layer is very soft and should relieve pressure on your shoulders and hips. You are looking for an affordable mattress. While the Cedar does have a lot to offer, it is on the pricier side. Natural latex is expensive to source, which makes this a less affordable mattress. The Cedar might be outside of some people’s budgets. If you want to save some money, I would look elsewhere. You like to sink into your mattress. If you prefer to sleep “in” your mattress, the Cedar might not be the best choice for you. With its coils and responsive latex, the Cedar does not let you sink in too far. You sleep more on top of the mattress rather than in it. You are a heavier-weight side sleeper. If you are larger and sleep on your side, you could feel some firmness on your shoulders and hips. I felt nice pressure relief, but I am not very large. Larger side sleepers could press into the mattress and feel pressure on those key areas. You are a stomach sleeper. If you sleep mainly on your stomach, you might not get the support you need on the Cedar. The top wool layer is very soft, so when you are on your stomach, your hips could sink too far into the mattress. When this happens, you could get out of proper, neutral spinal alignment. The mattress is 13” tall. The cover is made with soft, organic cotton. It is quilted with New Zealand Wool. Then there are 2” of all-natural, Dunlop latex. The next layer is 2” of convoluted Dunlop Latex. Then there are 8” of individually-wrapped support coils. Finally, the 1” base is made of coconut husk. The 8” of individually-wrapped coils help make this a very supportive mattress. The Cedar should be able to support even much heavier weights. The second layer of latex is grooved. This is meant to help with pressure relief. The latex gives some bounce to this mattress. It is a very responsive material and snaps back into place very quickly. It should be easy to move around on the Cedar. The top wool layer makes the mattress feel somewhat fluffy. Lightweight and medium-weight people will find it to be more fluffy, but heavier sleepers will probably push through to the latex layers beneath. The wool and latex are all-natural materials. These make the mattress a good choice for those who like to avoid certain chemicals in their mattress. The latex and coils are both very durable. This should be a longer-lasting mattress. The individually wrapped coils and ventilated latex layers promote airflow throughout the mattress, making this a very breathable option. In terms of firmness, the Cedar felt like a 6.5/10, or about average. You have a very soft, fluffy top and then you hit some firmer latex and coils. I will say that you might have a different experience depending on your weight. Lighter people might think it is soft, and heavier people might find it to be firmer. The Cedar was a good match when I was on my back. My hips sunk into the wool layer, but the latex stopped them from sinking in too far. I also felt like the mattress was conformed to the shape of my body. Overall, I felt great support. On my side, I did feel some decent pressure relief. The wool on top is very soft, so it relieves pressure on the shoulders and hips. However, I think if you are a larger side sleeper, the mattress might not be a great fit for you. You may hit the firmer layers and feel some pressure. Finally, when I moved to my stomach, the mattress was too soft for me. That top wool layer does not support my hips, so I do bow into the mattress somewhat. I believe most stomach sleepers will need more support than the Cedar has to offer. The mattress has a unique bouncy feel with a soft, fluffy top. The latex is very responsive and returns to its original shape very quickly. This makes it easy to move around on the mattress. Also, you can feel the support of coils beneath the wool and latex. Again, the feel of the mattress really depends on your weight. Lighter people may find the mattress to feel softer and fluffier, while heavier people might feel more of the latex and coils. When it comes to motion transfer, latex is not always the best material. During my tests, I was not surprised to see some real motion transfer on the Cedar. When I placed a glass of water on the mattress and pushed into the surrounding area, the water was quite disturbed. Also, I lay down on the mattress and asked Marten to move around on the other side. I did feel his movements on my side of the mattress. If you sleep with a partner, it is worth noting that you might feel their movements transfer to your side of the mattress. Given that the Cedar is a hybrid mattress with supportive coils, I expected it to feature some good edge support. The mattress did not disappoint. While sitting near the edge of the Cedar, I felt very secure and did not feel like I was going to fall forward. While lying down near the edge, I did not feel like I was going to roll off the mattress. You can see the Cedar’s solid edge support in the photo below. In terms of firmness, Joe said it was a 6.5/10, and I thought it was closer to an 8/10. I think this is because, as a larger person, I am pressing further into the mattress and feeling more firmness than Joe did. While back sleeping on the Cedar, I feel fantastic. My hips sink in just the right amount, and I feel great overall support. When I am on my side, I am feeling some serious pressure on my shoulders and hips. When I move to my stomach, my hips bow in somewhat, and I don’t feel the proper support. If you are a larger back sleeper, this is a great option. If you are a heavier side or stomach sleeper, I would look elsewhere. Being that Marten is a larger person, his experience is not surprising. While he felt nice support on his back, the Cedar was too firm for him when he was on his side. Again, side sleepers of Marten’s size might need to look elsewhere. The Cedar should be a supportive mattress, even for people of heavier weights. The coils, latex, and wool help make this a breathable, cooler sleeping mattress. The Cedar features very durable materials, so this should be a longer-lasting mattress. The latex and wool are all-natural materials, making this a greener, eco-friendly option. The fluffy wool top should offer good pressure relief to light- and medium-weight side sleepers. The Cedar is a bed-in-a box mattress, which means it will come compressed and be shipped straight to you. You will want to begin by removing the rolled up Cedar mattress from its box. Then, preferably with another person’s assistance, position the roll on your bed. Carefully cut away the first layers of plastic until the still-compact mattress can be laid down flat. Then, pierce through the final layer of plastic and the Cedar will expand. 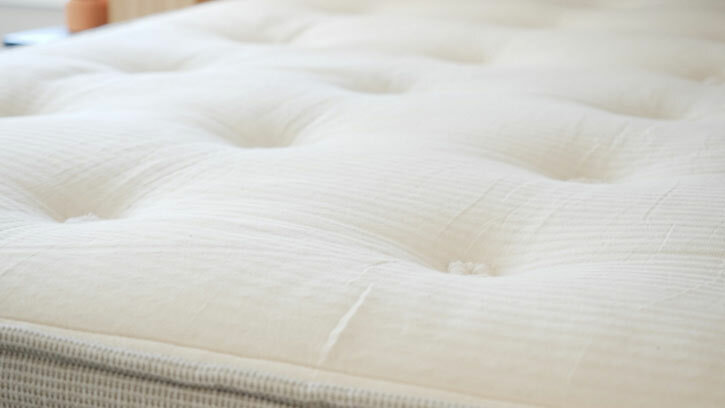 Simply clear away the excess plastic and allow your mattress to breathe and fully expand. In the end, the Cedar should be a great option for back sleepers of all sizes and anyone who wants a more supportive mattress. Fans of green and eco-products will also enjoy the Cedar. 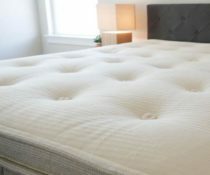 However, larger side sleepers and those who are looking to save some money might want to look for a different mattress. The Cedar comes with a one-year trial, free shipping and returns, and a 25-year warranty. Financing is also available. Curious: How high of a value do you place on warranties? Brentwood Home creates some very beautiful mattresses, which seem to be made with high quality materials; however, their warranty only covers an indent/sag greater than 2″. 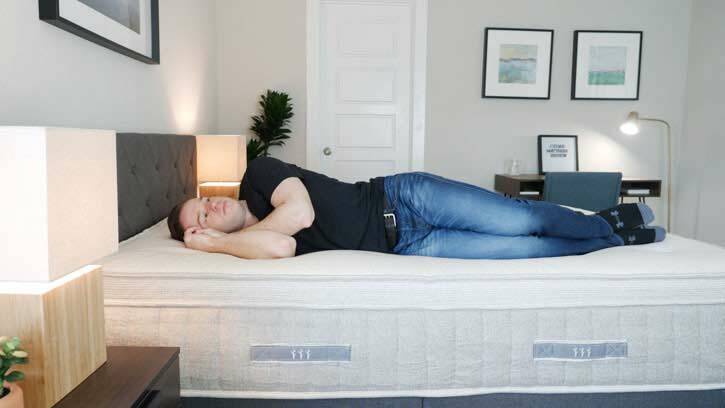 Theoretically, people can sleep on the mattress without it giving the support needed, causing significant pain until the indents surpasses the 2″ point. This has given me a great pause about ordering from Brentwood, but I also read the warranty details more thoroughly than the average Joe.😜😎 What do you think? Warranties can be very important. In this particular case, the latex is highly durable, so I don’t see sagging being an issue here for a long time.